The Miami Dolphins training camp will be centered around one thing – the return of quarterback Ryan Tannehill. The former Texas A&M standout and once-burgeoning star from 2016 has missed the last 20 games due to a left knee injury. While all signs point to his return to form this season, the team he fields will be much different than the Dolphins of ’16. When Tannehill suits up under center for Miami during training camp, several of his targets will be completely revamped while his backfield will no longer see the likes of Jay Ajayi, and rather will hold a stark comparison between the two ball carriers’ career timelines. Kenyan Drake enters his third season, on the heels of a career year after the team traded Ajayi midseason a year ago. Opposite Drake will be 13-year pro Frank Gore, the San Francisco 49ers all-time leading rusher who just spent the past three seasons in Indianapolis. Gore is seemingly far removed from his best playing days, yet put forth his best season since 2012 a year ago, and his seventh season out of the past eight years grading at 74.9 or above. 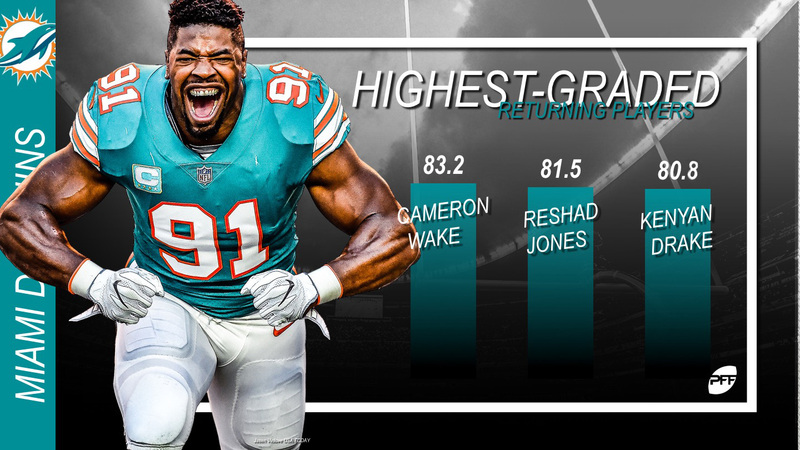 Tannehill’s defense returns several enticing players, like veteran Cameron Wake, who even at 36 years young, proved he can still produce with the best of them. Wake brought in 62 QB pressures on 365 pass-rushes a season ago, recording the league’s second-highest pass-rush productivity among 4-3 defensive ends. While they lost Ndamukong Suh to Los Angeles in free agency, Dolphins fans can rejoice in a pair of former teammates at Ohio State in their linebacking corps to potentially anchor their defense for years to come. Jerome Baker was selected in the third round after finishing 2017 with an 81.5 overall grade while Raekwon McMillan will suit up for the first time with the franchise that drafted him 54th overall in the 2017 NFL Draft. McMillan returns from a torn ACL and in his last action, graded out with an 86.3 overall grade, or 19th overall at his position in 2016 at Ohio State. One thing remains a constant though, this team will be centered around the success of their signal-caller who mans the helm of professional sports’ most important position. Behind Tannehill is a cast of unproven or unsuccessful characters in Bryce Petty and Brock Osweiler, so this team’s success will certainly be hinged upon Tannehill’s health. Aside from Tannehill, other areas of intrigue are popping up as training camp looms. Miami holds a lot of depth at tight end after double dipping in the 2018 NFL Draft and selecting both Mike Gesicki (second round) and Durham Smythe (fourth round). Gesicki could very well land the starting spot after an impressive spring that showcased what we at PFF had known for two seasons. Gesicki finished his four-year playing career at Penn State on the back of two incredibly impressive seasons ranking inside the top 25 in terms of overall grade at his position. He capped his career with an 84.9 overall grade in 2017, the seventh-highest grade out of 214 qualifying FBS tight ends. Smythe had a mixed bag of college success. He wasn’t targeted all too often in the passing game, seeing just 17 catchable passes thrown his way last season, dropping two of those for one of the nation’s highest drop rates. His positives were in the run game, where he saw an 80.2 run-blocking grade in 2016. If he can round out his receiving skills to match his run-blocking prowess of two seasons ago, Smythe could find the field more often. Gavin Escobar enters the mix after four seasons with the Dallas Cowboys and is joined by A.J. Derby, MarQueis Gray and Thomas Duarte in the tight end room. With that experience in the room, if Gesicki can win the starting job, he’ll certainly have earned it. The Dolphins offensive line has been a unit susceptible to criticism for some time and this offseason, they went and attacked the free agent market to address glaring holes. They signed Josh Sitton and Daniel Kilgore to man this ship as Sitton has long since been one of the league’s premier guards. He has not seen a grade lower than 85.9 (2012) since his rookie season in 2008 and is on the heels of an 86.0 overall graded season that saw him rank fifth among guards. Kilgore enters camp after a down season to end his 49ers career, finishing with a 51.6 overall grade. However, he showed the ability to bounce back from a subpar season in 2016, finishing with a 71.6 overall grade after putting forth a career-low 42.8 in 2015. With Sitton’s signing, he’ll be pencilled into the starting left guard spot, which leaves Jesse Davis and Ted Larsen to fight it out at right guard. Davis saw significant time at right guard (433 snaps), left guard (177) and at both tackle positions (126 combined), so his versatility might be his tipping point to winning the job. Larsen finished the season at left guard from Week 10 on but limped to a 39.5 overall grade. 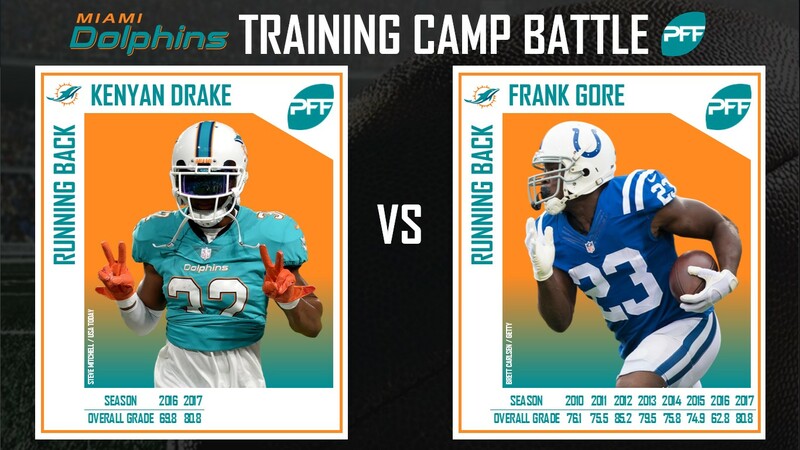 Running backs on two ends of the spectrum should battle it out for touches in training camp as the veteran Gore joined the Dolphins this offseason to push Drake in the running back room. Gore is on the heels of his best season in the past five years, eclipsing the 80.0 overall grade mark for the first time since 2012. Drake is fresh off a career year, finishing with an identical 80.8 overall grade to Gore’s final season tally. They both finished the season in the top 20 among the league’s running backs in terms of total missed tackles forced on the ground as Gore broke 35 tackles on 261 attempts and Drake recorded 29 missed tackles forced on just 133 carries. Drake’s ascension to the upper echelon at the position can be complete with another strong showing this season. He led qualifying running backs with at least 81 attempts (53 running backs) in terms of yards after contact per carry, seeing an average of 4.29 yards per carry after contact. With Gore’s guidance (and his own skill in the backfield), the backfield battle between the two should be not only interesting, but beneficial for their success this season. For at least this season they do. Tannehill is due a hefty pay day and a sizable hit to the Dolphins salary cap in 2019 ($26.6M) despite restructuring his contract details earlier this offseason. Due to that, 2018 seems in all likelihood like a make-it-or-break-it year for Tannehill and the Dolphins. They’ve invested in the offensive line and brought in playmakers like Gesicki and Smythe through the draft while signing wide receivers Danny Amendola and Albert Wilson to give Tannehill weapons to work with. Training camp will go a long way for not only the new cast of characters to blend together, but for Tannehill to get back to playing football. And for ensuring the coaching staff and fans alike that we’ll get to see him on Sundays this fall.